Find out more about moon and tide cycles. 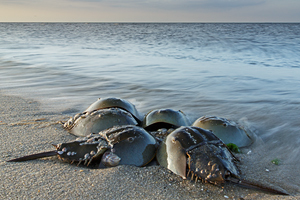 Horseshoe crab spawning season varies according to latitude, but it generally peaks in May and June, with peak spawning occurring on evening high tides during the full and new moons. The adults seek beaches that are at least partially protected from surf, within bays and coves. When the Limuli head for shore, the males patrol along the foot of the beach, awaiting the females. The female horseshoes give off chemical attractants called pheromones, which the males can detect. 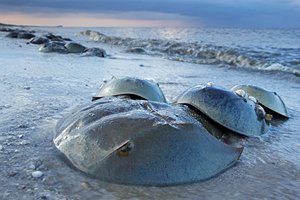 Although there may be other means of identification, these attractants, the directional movement and the number of males involved (often several times the number of females) reduce the liklihood of a female reaching the beach unattended. Males, who are about 20% smaller than females, use a specially developed appendage to "clasp" themselves onto the back of the female. During peak spawning times, the horseshoes will form a dense "huddles" along the edge of the water, with 5 or 6 males grouped around one female. By the beginning of the spawning season, each female will have developed about 80,000 eggs, which are located in dense masses near the front of her shell. She will return to the beach on successive tides, laying 4-5 clutches of eggs with each tide. Each cluster contains about 4,000 eggs and a female will lay about 20 egg clusters each year.